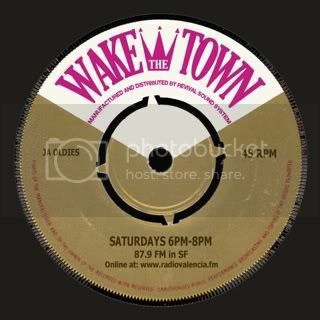 Tune in to “Wake The Town” on 87.9 FM Radio Valencia in San Francisco (also broadcast Live worldwide online at [www.radiovalencia.fm]) every Saturday night from 6pm - 8pm (Pacific Standard Time) for 2 hours of ‘60s Ska, Rocksteady and Early Reggae 45 rpm sounds! Brought to you by Adam (Revival Sound System) & Bryan Martin (SF Vintage Reggae Society) + special guests! Edited 2 time(s). Last edit at 02/13/2012 04:28AM by wakethetown. Edited 3 time(s). Last edit at 09/16/2011 04:53PM by wakethetown. Tune in to “Wake The Town” on 87.9 fm Radio Valencia in San Francisco (also broadcast Live worldwide online at [www.radiovalencia.fm]) every Saturday night from 6pm - 8pm for 2 hours of ‘60s Ska, Rocksteady and Early Reggae 45 rpm sounds! Brought to you by Adam (Revival Sound System) & Bryan Martin (SF Vintage Reggae Society) + special guests! Edited 1 time(s). Last edit at 02/13/2012 04:28AM by wakethetown. maximum respect to Jah Warrior Shelter Hi-Fi! Edited 2 time(s). Last edit at 10/30/2011 11:09PM by wakethetown. Hey, could u give this a mention on you show this saturday? Scott! where have you been my friend? Ba Ba Boom tune indeed. Hope to see you soon man. Tune in to "Wake The Town" on 87.9 fm Radio Valencia in San Francisco (also broadcast Live worldwide online at www.radiovalencia.fm) every Saturday night from 6pm - 8pm for 2 hours of '60s Ska, Rocksteady and Early Reggae 45 rpm sounds! Brought to you by Adam (Revival Sound System) & Bryan Martin (SF Vintage Reggae Society) + special guests! Tune in to “Wake The Town” on 87.9 fm Radio Valencia in San Francisco (also broadcast Live worldwide online at [radiovalencia.fm]) every Saturday night from 6pm - 8pm for 2 hours of ‘60s Ska, Rocksteady and Early Reggae 45 rpm sounds! Brought to you by Adam (Revival Sound System) & Bryan Martin (SF Vintage Reggae Society) + special guests! Highlights of the NYE Derrick Harriott Show in San Francisco will be aired on tonight's episode of "Wake The Town"
Edited 1 time(s). Last edit at 01/07/2012 07:33PM by wakethetown. 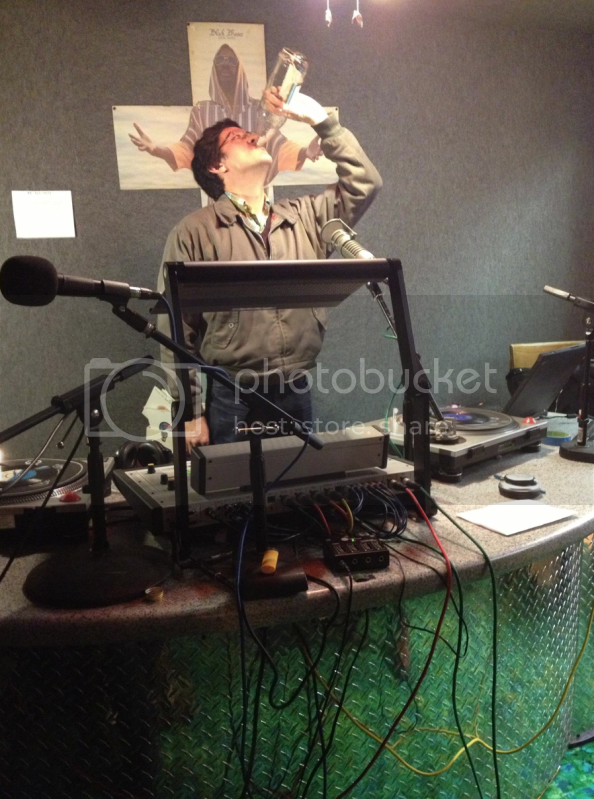 ***HEAR CLIPS FROM THE NEW YEARS EVE SAN FRANCISCO DERRICK HARRIOTT SHOW IN THIS EPISODE! Edited 2 time(s). Last edit at 01/08/2012 06:57PM by wakethetown. Tune in to “Wake The Town” on 87.9 fm Radio Valencia in San Francisco (also broadcast Live worldwide online at [radiovalencia.fm] every Saturday night from 6pm - 8pm for 2 hours of ‘60s Ska, Rocksteady and Early Reggae 45 rpm sounds! Brought to you by Adam (Revival Sound System) & Bryan Martin (SF Vintage Reggae Society) + special guests! You mean Lars from (Skankin Pickle)!!! Edited 1 time(s). Last edit at 02/05/2012 07:29PM by wakethetown. Edited 1 time(s). Last edit at 04/02/2012 07:27AM by wakethetown. All the shows I've heard are great, but there's some real special tunes in this one. yes sir. thanks for checking in. Whitey Norton has some ridiculously amazing tunes in his collection and it is indeed a blessing to have him around locally to share and educate. nice on the calypso Adam! Is it Cyril Diaz (sp?) "Taboo", that has this melody on the chorus/chant vocals and horns? Edited 2 time(s). Last edit at 06/25/2012 02:13AM by wakethetown. Edited 2 time(s). Last edit at 09/17/2012 12:14AM by wakethetown. Edited 2 time(s). Last edit at 12/02/2012 08:05PM by wakethetown. DJ Mini aka "Madame Streggae"
Edited 1 time(s). Last edit at 12/02/2012 08:05PM by wakethetown. Edited 1 time(s). Last edit at 12/17/2012 09:43PM by wakethetown. Edited 1 time(s). Last edit at 12/23/2012 09:24PM by wakethetown. Edited 2 time(s). Last edit at 01/22/2013 08:51PM by wakethetown. Really great show. Thanks Adam! WHEN IS THE NEXT LIVE SHOW!!!! !